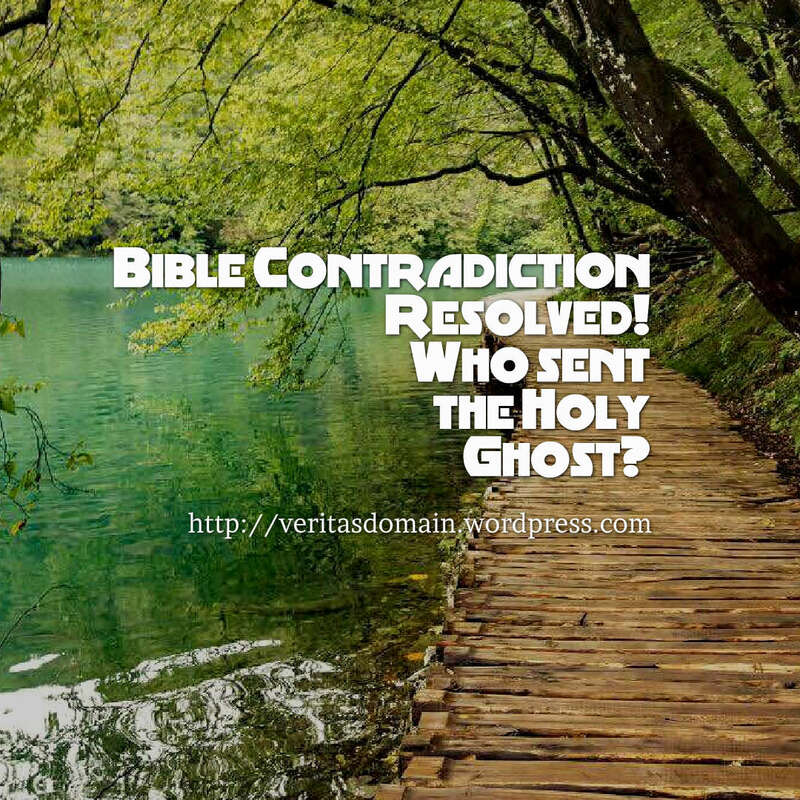 For today’s post we will tackle the question the Skeptic Annotated Bible asked: Who sent the Holy Ghost? It is always worth the time to check to see if the skeptic interpreted these verses properly since many of these alleged contradictions are the result of a mistaken interpretation of what these verses actually mean. The skeptic did used both John 14:16 and John 14:26 properly to demonstrate that the Father sent the Spirit. John 14:26 explicitly said “the Holy Spirit, whom the Father will send” while John 14:16 in talking about the Father using the pronoun “He” is saying the Father will send the “Helper” which we know in the context is the Holy Spirit. Note all the verses here in question (John 14:16, 14:26 and 15:26) all mentioned the role of the Father and Jesus in sending the Holy Spirit. Technically these verses are not contradictory with one another when they are agreeing both the Father and the Son sent the Spirit. The three Bible verses cited actually indicates that the Father and Son sent the Spirit. The Father and Son sent the Spirit in different ways which makes it unlikely there is a Bible contradiction here. Since the Spirit is with the Father it makes sense that in John 14:16 Jesus asked the Father to send the Spirit. Then in John 14:26 we learn that Jesus said the Father will send the Spirit as Jesus requested and that the Father will send the Spirit in the name of Jesus. Thus we can see different sense that the Father and Son sent the Spirit. On the one hand the Father is the original starting destination for the Spirit if you will. The Father also sends the Spirit in Jesus’ name. On the other hand the Son is the One who sends forth the Spirit by petitioning God the Father for the Spirit to go forth. There are many every day example in which it is not contradictory to have two or more individuals or referents be the ones who send someone or something. As a parent sometimes when my kids misbehave my wife “sends” the kids to me for correction. I also verbally call for them to come to my office. We are both “sending” the kids to receive correction. A young American Marine could be sent to battle by both the President and the Secretary of Defense. It is not contradictory nor mutually exclusive to say both sent the Marine. Say you order something from Amazon. After a few days of not getting what you purchased you wonder if Amazon has sent the merchandise so you check your order online on their website. You might also check on the Postal Service’s website to see if they sent it already or you want to track their progress with what they are sending you. Note it would not be contradictory to say “Amazon sent me my order” and “The Postal Service sent me my order.” They are used in different senses that are not mutually exclusive. The only way there can be a Bible contradiction here is if at least one verse said “Jesus is the ONLY one who sent the Spirit” or “The Father is the ONLY one who sent the Spirit.” But none of these verses says that. Thanks for examining this alleged contradiction. Steve Wells is touching upon the second great disagreement between Roman Catholicism and Eastern Orthodoxy, the first one being the primacy of the bishop of Rome and the second being the “Filoque” controversy with the Latins saying the Holy Spirit proceeds from the Father and Son and the Greeks saying the Holy Spirit proceeds from the Father only. Of course as both groups continue to quibble over this point they miss the Gospel of salvation by God’s grace through faith in Jesus Christ alone. I was so focus on answering this Bible contradiction I didn’t think much about the Church’s Filoque controversy until you commented so thank you for bringing that up. In my view the controversy was quite early in the Church before there was Romanism and Eastern Orthodoxy (well before the East and West church split in what, 1096 or 1090s?). Of course this is one of the doctrines that led to the split and disagreement between the Latin speaking and Greek speaking churches which I personally don’t necessarily label as Roman Catholic or Eastern Orthodox since at that time there was still “One” Catholic (universal) Church. I do think the Western “Churches” (including Protestants) are right to see Jesus also sent the Spirit because it says so in Scripture. Some of the discussion between East and West in the past doesn’t make sense to me for instance the Eastern churches saying the Western churches has no right to modify creeds since there was not a council or universal agreement of the total Church to say the Son also sent the Spirit. This already presuppose a certain theological method but for one who hold to Sola Scriptura its not my method but we go by what Scripture says. I”m more interested in exegesis than sociological group-based “Hey lets count to see if everyone agrees” method at arriving at doctrines. Thanks for the good additional thoughts on the Filoque disagreement! Hi brother if I may say the Holy Spirit is not a mother or a she but a He. 3 Beloved, while I was very diligent to write to you concerning our common salvation, I found it necessary to write to you exhorting you to contend earnestly for the faith which was once for all delivered to the saints. 4 For certain men have crept in unnoticed, who long ago were marked out for this condemnation, ungodly men, who turn the grace of our God into lewdness and deny the only Lord [a]God and our Lord Jesus Christ. If people think we are contentious or mean we shouldn’t care we are called to contend for the Faith souls are at stake agree? The New Testament uses masculine pronoun for the Holy Spirit. It is an unbiblical belief of cults and theological liberals that make the Spirit a “she” and they arrive at that wrong conclusion with problematic word study fallacies. Here’s a post that I wrote on this a while back of those that tries to twist the Word of God: https://veritasdomain.wordpress.com/2016/10/04/jory-micahs-word-study-fallacy-on-calling-holy-spirit-she/. Secondly concerning Jude 3-4: The Greek word for “contend” has the idea of compete for victory in its normal usage. It doesn’t have the idea of being mean or a jerk. Jude 3 is telling us to not fall away with false teaching but keep on pressing forward towards the prize so to speak, to use Paul’s illustration. Whenever someone say we are contentious or mean I typically stop and consider to see if what they say is true; a good heart check is good, plus the older I get the more I know I’m really sinful and the more slower I am to dismiss people when they say that. We are to defend the faith yet, but do so in a Christ-like manner. Sometimes people might accuse us of being mean when really we are not in order to distract us from the subject as hand. In such instances when we really are not mean we need to note that they are making a logical fallacy of attacking our character which is not relevant to the discussion at hand and focus back on what is at stake. Does that answer your question brother? Tell me what you think! Sorry fat fingers. How does the Skeptic Annotated Bible list this as a contradiction? Clearly its so simple to rebut this. No worries. While it is a superficial argument from the skeptics it did take me a while to write this more thorough response to make the refutation have more bite and exegetically faithful to the passages’ intent. Thank you. This is an informed and learned response. I’m big time blogger and I actually loved most of the posts on your website. They are very informative! I am reading about this article’s topic for the first time and it has genuinely peaked my interest into the topic. I followed your blog and I am looking forward to more interesting content here. Funny, I hadn’t thought their was a question – it seemed a noncontradiction to me from the beginning. But sometimes I wonder if it’s because I was born and raised Christian and therefore “taught” not to question. And sometimes I realize it’s not a question at all because the contradiction simply doesn’t exist. LOL you caught the ending! I suppose when you reblog it you are resending it back to me without rescinding i! OUR ONE TRUE GOD the HEAVENLY FATHER Sent HIS HOLY GHOST ( HOLY SPIRIT )!! Thank you for these words of blessing Kristi, and thank you for reading the blog! Could it be that Jesus us the father of the holy ghost? I’m confused by what you said. Are you asking if Jesus is God the Father?